The Coca-Cola Company is acclaimed for many of its advertisements, but there’s more to it than just copy and creative. The company strives to tell stories in its advertising spots because good marketing boils down to brilliant storytelling. More importantly, the company aims for storytelling with a social purpose. 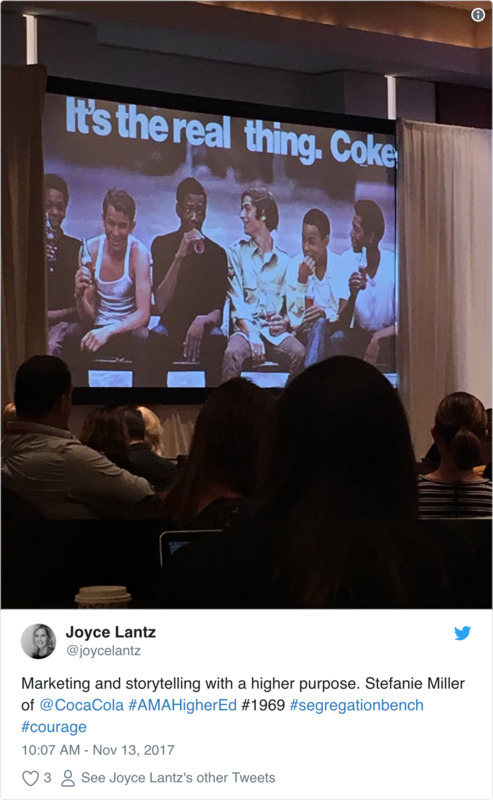 So said Stefanie Miller, a senior marketing leader for the beverage maker in a keynote address in a standing-room-only ballroom at the 2017 Symposium for the Marketing of Higher Education. While some Coca-Cola ads spots may seem innocent today, they were often very controversial at the time these were aired. As a global brand – doing business in every country in the world except for two – there’s very little company does that isn’t closely scrutinized. Taking a public stand on an issue or cause isn’t something the brand does casually. Does every story with a social purpose drive more cola sales? Probably not, said Ms. Miller. At least in the short term, but then again brand development takes years, and in Coke’s case, even decades. With one of the most recognizable brands in the world, clearly, Coca-Cola is onto something. In the 1990s, the glass ceiling had begun to crack according to Ms. Miller. In 1994, Coca-Cola ran the “Diet Coke Break,” which turned social dynamics of the day upside down. The commercial was one of the first, if not the first, advertisements to “objectify” a man. Understanding how to push the boundaries of social norms in storytelling requires a contextual cultural awareness. In the mid-2000s the rise of violence-laced video games brought with it concern the brutality was spilling over, from a virtual world, into the real world. The beverage maker flipped this on its head and “imagined an animated hellscape that looked a lot like ‘Grand Theft Auto’ turning into a land of peace and harmony thanks to the power of love (and Coke),” as AdAge put it. 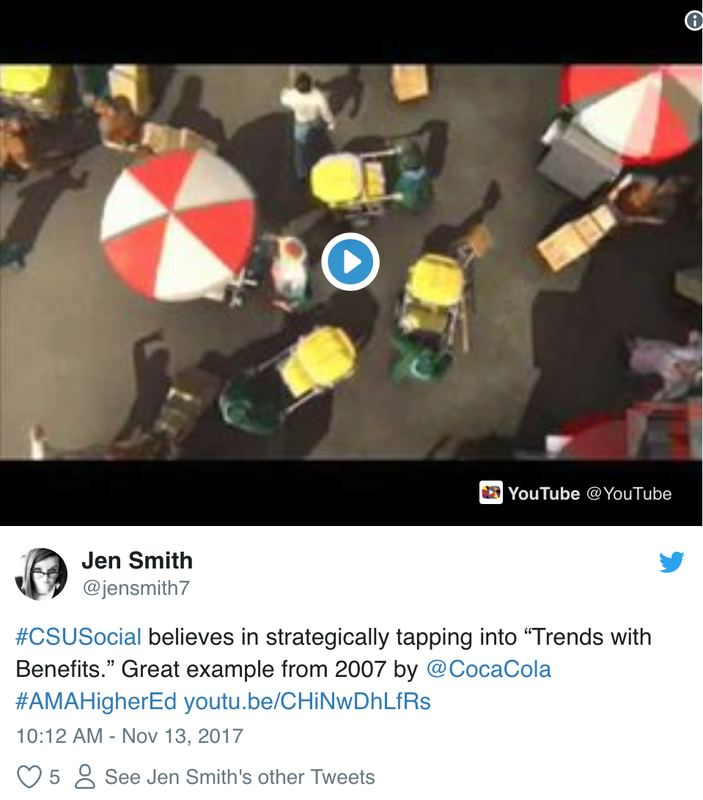 If there is a unifying theme in the Coca-Cola stories with a purpose, it is that they are “stubbornly optimistic.” Indeed, Coke strives to see the best in humanity, and then help everyone else to see it too. inMotionNow is sponsoring, exhibiting and attending the 2017 Symposium for the Marketing of Higher Education by the American Marketing Association. The conference is being held in Atlanta from November 12-15, 2017. If you’re attending, please feel free to stop by booth #26 to say hello and talk about creative workflow management. If you are unable to attend, there is a lively and engaged community tweeting up the conference under the hashtag #amahighered. Want more ways to be your creative best?